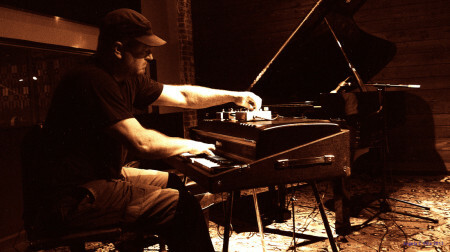 The remarkably diverse and perpetually touring pianist Thollem McDonas lands at the Chapel for contrasting sets joined by two of Seattle’s finest percussionists, an electric piano set with Greg Campbell and an acoustic piano set with Paul Kikuchi. “A fresh, disciplined avant-pianist with an attractively extreme viewpoint” (LA Weekly), Thollem McDonas is a peripatetic pianist/keyboardist, comproviser, singer-songwriter, educator, and social commentator. His musical compositions and performances range from post-classical, to free jazz, to noise to punk rock to… He has been touring perpetually throughout North America and Europe since 2006, performing solo works and collaborating with an array of musicians, dancers, and filmmakers. Added to this is his Keyngdrum series of improvised duos with a sprawling roster of drummers met along his perpetual touring schedule, with Thollem playing acoustic as well as electric. Thollem was born and raised in the San Francisco Bay Area. At the age of five, he began studying the keyboard repertoire from the medieval to the 20th century and studied with many notable teachers including Aiko Onishi and Lou Harrison. After graduating with degrees in piano performance and composition, he stepped from the concert pianist trajectory to dedicate his time to grassroots political movements and ecological restoration projects. He returned to music as his full focus in 2005, incorporating his myriad experiences into his compositions, improvisations and teaching. He has performed extensively as a soloist as well as in piano concertos with symphonies, West African drumming troupes, Javanese gamelan, punk bands, film makers, dancers, poets and painters, and a wide array of divergent musicians, both famous and under-known. He is the founding director of Estamos Ensemble, a Mexican-American cross border ensemble for musical exchange. In the past seven years, he has added 35 albums to his discography on 15 different vanguard labels. His music is diverse, with each album and every concert exploring a variety of approaches and paths, resulting in dramatically new and different outcomes.